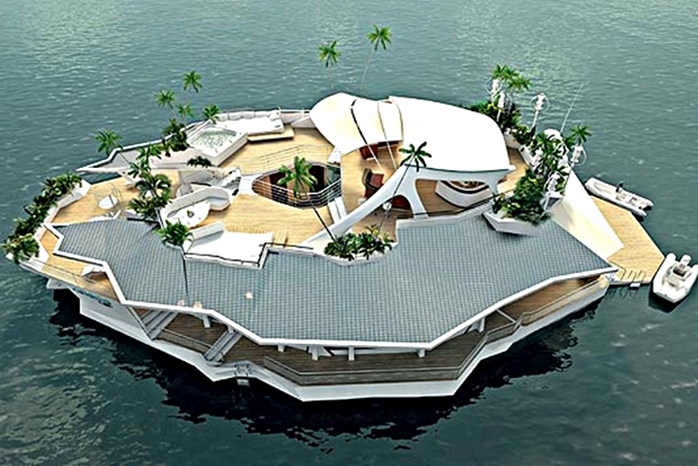 An Austrian company, led by entrepreneur Gábor Orsós, has unveiled its plans for a luxury floating island, called “ORSOS Islands”. Orsós originally planned to put up an exclusive, high-quality hotel chain based on floating platforms, but he expanded his idea because he wants to reach a broader audience. The Orsos Island is set to have around 1,000 m² of living space, with six double bedrooms with bathrooms and a restaurant area. It features a bar, sundeck area, jacuzzi and an aquarium. It can room up to 12 residents, including accommodations for up to four staff members. It is described as “more comfortable than just about any luxury yacht”. It will be an eco-friendly island, powered by a noiseless wind energy system and extensive solar panels. The luxury island can be customized to fit the customer’s taste, with the basic model costing as much as 3.6 million euros (£2.91m). This ambitious project should be available to the public by the end of 2013.